Description: WIPER MOTOR ARMATURE, Converting your 6-volt wiper motor into 12-volt just became a snap with our new conversion armature. No need for those bulky, unsightly and unreliable voltage reducers, our conversion unit converts voltage the proper way and installs in less than 5 minutes. 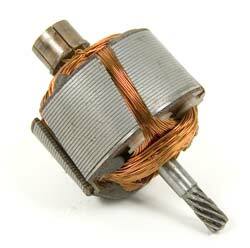 Works on all SWF brand wiper motors, 1958-1966 Beetle and 1955-1964 Bus. Please verify brand of your wiper motor prior to ordering.